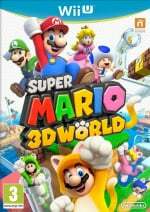 Super Mario 3D World, particularly with the delay of Donkey Kong Country: Tropical Freeze, is arguably the most notable big-name Nintendo blockbuster with the task of driving Wii U Holiday sales. Up to now relatively little had been seen beyond the E3 reveal and the demo build that's been doing the rounds at various events, yet today's Nintendo Direct broadcast showed much more of the title in action, and it may help to win over some of those with doubts about this one's appeal. New footage showed a variety of locations and, most notably, power-ups. There's a cherry that allows you to duplicate your character, an ability to essentially dress up and pretend to be a Goomba, piranha plants that can be carried, and a particularly fun-looking cannon head that'll allow you to blast enemies away. We also saw the return of the Tanooki suit, twists to the gameplay mechanics of this budding series — following on from Super Mario 3D Land — and Bowser now has a rad car; the car's awesome enough to merit a mention, we feel. Arriving in North America on 22nd November and in Europe on 29th November, this is certainly a big-hitter on the way. Check out the footage below and let us know what you think. People still don't care about this not being a galaxy/64/sunshine sequel after that trailer? NOW I WANT-A-SUPER MARIO 3D WORLD!! That trailer made me even more excited for this game. I do wonder what controller styles will be compatible with the game. This looked so bland and predictable back at E3, but now it's looking fantastic. Whoever made the first trailer should be reassigned to something else at Nintendo, because there's a night-and-day difference between that one and today's! This should have been the E3 trailer. 4 characters that each play differently. AND you can play multiplayer w/ 4 different characters that each play differently. You can replay this game many times w/ enough people. @Ideal_Hero I think they already stated that you can use the GamePad, Wii remotes or the Pro Controller. I believe you can also use the Wii Remote or Wiimote plus Nunchuck as well. This game just got 100 times more awesome with the addition of Bowser's rad car. using the piranah plant is brilliant. That is considerably wacky! Fresh new enemies and powerups. @CapnPancakes Makes sense. They ought to support all controller options (the Wii U certainly has enough of them). And amen to Bowser's car. Here's hoping it shows up in Mario Kart 8. They made it. I wanted them to make me interested in this game because so far they hadn't, and BOOM! Now I'm a bit hyped. Well done. Was already hyped for this game, but today's trailer was great and so far a lot of people who had initially disliked it are now pleased with what they saw and are looking forward to it's release. Star of the show for me. Meh. I still see way too much Super Mario 3D Land in there. They are even reusing bosses. I'm interested in this now - not least because this trailer showed that this will be an effective single-player game. The last one kind of implied that it was geared up almost entirely for multi-player. Starts off like Mario galaxy, then suddenly im watching a chips ahoy commercial. Am I the only one who gets an good feeling from the fact that it has world in it's name. I'm hoping it is as awesome as super Mario world (I know, dreaming big). This was a great trailer and exactly what this game needed to get people excited. Lots of new stuff and twists on some old stuff too. I can't wait. Oh Super Mario 3d World. I'm sorry I ever doubted you. I did think the original E3 stuff shown was promising even though the levels were the early bland kind. This IS the kind of game I imagined when I heard it was mostly the Galaxy team working on it so I wasn't too worried. Good to see the potential fulfilled. Of course, it has been a long time. They probably showed most of what they could. They had to go final on playable demo stuff and the coolest stuff shown here was probably being worked on but not able to be shown or played. This is going to be tons of fun. I guess it's platforming for the end of 2013 (Rayman, Sonic LW, and this) Probably too crowded for DKC anyway! @VoiceOfReason Nope. You're not the only one. Though I do hate that there's a 3D in the name. This isn't a 3DS game, for crying out loud (though, without the "3D" it's just Super Mario World, which is confusing). Yes, that 3D may throw some people off. I admit I did not really care about this game when it was first announced. Now that I've seen this I may get it for Christmas. My opinion on this game has completely changed! I think it looks amazing,i love the new power ups and that green fairy character is so cute (i really want to rescue her) ! I also love the overworld (level map) and the way you can walk around it , it's the small things that make a difference ! That awesome car has to make it's way into Mario Kart 8 ! 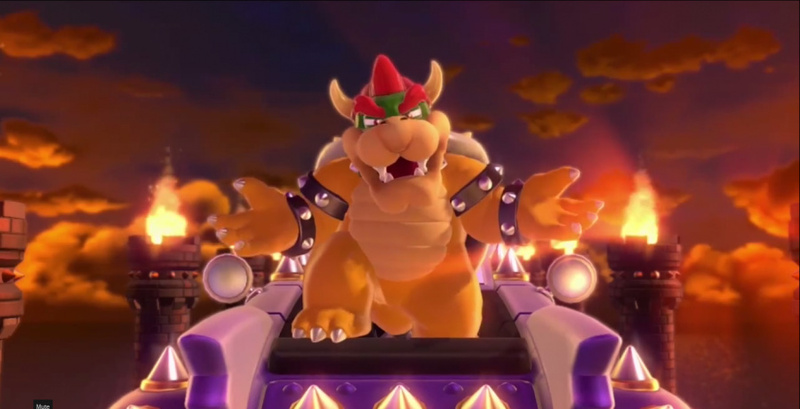 I am kinda disappointed at seeing that mini-boss koopa again(i don't know his name) - he played to much of a roll on the 3ds and was incredibly easy to beat in my opinion, i hope he has a smaller role in this game ! Yeah, great trailer. Even more excited for this one now. This game looks absolutely incredible and way better than either of the Galaxy games. People need to stop hating this game, and hopefully this trailer goes a long way in that regard. When I was a kid Mario games were about getting from the starting point in the level to the flag pole at the end. That is what a Mario game is supposed to be - not this start collecting garbage that started in 1996. Mario 3D Land is the best Mario game since Super Mario World because it brought the series back to its roots. It played like a 2D Mario game only in 3D. Each level was its own thing and all you had to do was get to the end of stage. Basic, simple, and perfect. That is what a "3D" Mario game should be. @thesilverbrick The 3D in the name is not for the 3D effect but for the fact that you have 360 degree 3-dimensional movement that sets it apart from the original Super Mario World. I believe the same applies for Super Mario 3D Land. The 3D has nothing to do with a steroscopic 3D effect. Here's to hoping that if this is successful we get Super Mario 3D World 2: Yoshi's 3D Island!!!! Ok now I'm 100% sold on this game... I just doubt the multiplayer will make the game any better. People were jumping to conclusions too quickly with this game, I knew the game would be epic. @Pachterkid I completely agree 99% (I still like the star collecting too). Even though Galaxy sort of went back to the roots with power-ups and all, 3D Land did it so much better because you had mini-Mario and the mushroom and all. Plus power-ups were far more important and relevant in each stage in the 2D games and 3D Land than they were in the Galaxy games. In those, the power-ups were few and far between. @Haxonberik I think it's way better than the NSMB Wii and NSMB U multiplayers because of the scores at the end of each stage. That trailer just changed my mind about this game. That looks soooo much better than the E3 trailer. I've been pretty down on this since the reveal, and even more so after playing it at Eurogamer, but this certainly grabbed my attention again. I was already really excited to play this game but now I'm extra excited Can't wait to play it both singularly & in multiplayer! However my question is how will the end game be for this game? Will we have just a star world, or will we have like SMG where we had green stars on top of the star world. The lesson here is trust Nintendo, I have been a massive fan since the NES and very rarely do they make a game that isn't fun to play thats why we still by into their systems after all. This game looks creative and I'm really looking forward for it! New powerups and new ways to play. But I still don't know what the story of the game is now that Bowser has something even better to kidnap instead of Princess Peach. Is it the mario game I wanted. Nope. Not even. But, still looks like a great game my wife n son are sure to enjoy! Still not sold. Level design is too sterile and not dynamic enough. It was clearly designed with four players in mind and will lack the finesse that a true-single-player experience can provide. I thought I was being swayed as I watched the trailer, but after watching some straight gameplay vids it occurred to mean that the trailer was just put together really well. Music was great, some of the power ups were cool, but I still think I'm going to skip on it...sadly because it's not the game I wanted. Getting a star at the end, running down a flag poll...what's the difference? It's still the same end-game. I'll be the first to admit: I hated this when I heard about it. Looking at that trailer, I want it. Seems like many others feel the same. And just like that, my interest in this game doubled. I've never doubt of Nintendo with this game! They never dissapoint with their biggest franchises! This trailer looks 100x better than the original E3 trailer and now november 22nd is my most anticipated day of the year. This game and A Link Between Worlds, BOTH on the same day!! I'm alot more interested in this game due to this new trailer, going to pre-order now. This should be awesome to play with the family at xmas. this trailer makes the game look 100% better than all the other trailers before did. Trailer blew me away. The game looks stunning. Insta-buy. How anyone ever thought nintendo would not release a quality game when talking a 3d mario is beyond me, really. This has just been added to my must buy list. Wow i wasnt sold on this game but now i cant wait.! looks amazing wow! I was excited before the Direct, but this was one of the best trailers I've ever seen. Day one purchase. I'm certain this will be one of the best Mario games ever. I will be showing my little brother this trailer when he gets home. We already wanted 3D World back at E3. The addition of this trailer just reconfirms that it'll be a great investment for the Wii U.
I was getting this no matter what cause I play Mario games multi-player with my wife and kids, but now I am actually excited about this game. Looks really good. never doubt it at all. i knew every mario game will be awesome. another reason to own a wii u.
I'm sold, clearly Nintendo has proven they are unmatched when it comes to 3D platform games. Nothing current out there looks as inventive as this on another console. Shame to see so many negative comments, this looks fantasticly fun. This game looks absolutely fantastic. This looks so amazing. The initial negative reaction probably won't last, they really have done a good job with this game. This is the game I'm the most excited about It looks AWESOME ! I kind of knew they will come up with something cool although the first trailers were quite dull. But man, this looks way cooler than I expected. I'm excited. I was sold, when was it shown on E3. This, THIS right here is why I have been a Nintendo fan since 1985! GAMEPLAY! Well, someone's anticipation for this just went WAY up. And that's some beautiful scenery in some of those parts! My one concern: I hope it's more challenging than SML3D. I love that game, but it's not nearly hard enough (which is why I usually ignore the tanooki suit). I'm still disappointed in the direction they went with, but I'll admit that now it looks about five times better than it did at first. So, this game will have a separate game modes for multiplayer and single player? This game now now has my attention, though it still looks very 2.5 D to me. All you 3D World doubters owe EAD Tokyo an apology. Wow, I am still disappointed. I really wanted a Sunshine sequel or at least that style of game. I might get this when the price drops. Still disappointed. I am really surprised, this looks better and better. Great music also. Still isn't the HD Mario game I wanted,but it looks actually quite good. Who needs another Galaxy game when we are getting Mario 3D World AND Sonic Lost World. Cat looks horrendously overpowered. Not sure that's good or bad. Also, I want to know what Nintendo has against free moving camera 3D games. It seems at most, the games were you could look around, it was never with a normal free moving camera, the press a button to look forward at most, or stay still and look around. The 3DS being made without a 2nd Circle Pad, the Circle Pad Pro while made, was heavily discouraged from being purchased or use by Nintendo. Not dissing this game specifically for this, just wondering why Nintendo has been so insistent on the route of fixed camera game design. This game looks SOOOOOO much better than it did at E3! @Warruz I'm hoping for 3D Land style S-Worlds of each of the original worlds. Also, in 3D Land, after you beat every world, and unlock Luigi, the game starts to keep track of the levels you beat with Mario, Luigi, and yellow flags. That motivated me to get all 3 stamps for each level. Looking forward to keeping track of 5 stamps with this game! No, it is called the Sprixie Kingdom. Check Nintendo UK's site for the game. @Ideal_Hero The Classic Controller, Wii Remote, Wii Remote + Nunchuk, GamePad, and Pro Controller. Whelp, after the new trailer, its definately going on my birthday/Christmas list. Good to know the Cat suit isn't the only brand-new power-up! I need more money fast!!!!! That lava oh my god that lava. I was already interested in this at E3, but now it looks even better! While it does look at lot like SM3DL, I can tell that they are rebuilding on that formula and making it even better. I'm really exciting for this, and I'm not usually one to get excited for Mario games, since they tend to be just like the last one... but I think this will be different. And I really love the jazzy music for it, too! Is it just me or the graphics just got better than the past trailer? I will get this after it comes! Awesome trailer! Mark my words, this will be much better then most people think it will be!! Is anybody still doubting this game? I for one am stoked for it now. This really looks amazing now. Love the music on this trailer. And if Link can bottle fairies, why can't Bowser? Even the bottle looks the same. Glad to see that this game is getting more praise! Anyway, I can't wait much longer for this game! It looks simply fantastic, if not amazing! This game could turn out to be the cats meow! The release date cannot come soon enough! The Mushroom Kingdom is looking beautiful! It looks like Mario Bros 2, Mario Bros 3, Mario 64, and Mario Galaxy all got perfectly blended together into an one awesome game! I'm so HYPED! This game looks amazing! Am I the only one who noticed the cat enemies? Better 4 than none, right? Nintendo isn't exactly the best at integrating online. I honestly wasn't expecting ANY online for that game. So I'll take those 4 events, especially considering the international competition and earning medals for your country. That's an awesome bonus I wasn't counting on. Those bosses are the Koopalings, and have never, not once, been featured in a 3D Mario game for a home console. They are a staple of Super Mario World, of which this game is a return to form. To NOT include them would be awkward. We WANT the Koopalings to return- it's what makes Mario World, well, Mario World. If you want Sunshine, go play Sunshine. Some people actually like not getting the same thing over and over again. And this game here, it's never been done before on a home console. Matter of fact, this style of game has only been remotely done once before, in the handheld title 3D Land. But this game is light years ahead of 3D Land, so much so I dare say I don't see any resemblance at all, save the similarities in name. It's not reasonable to pick a random Mario game, and tell yourself that's the only kind of game that can be fun, or great. And then when the game turns out to not be what you envisioned it should be, dismiss it simply because it's not how you had imagined it should be. Sunshine is over with. Gone. This is a new generation, and with it comes a new style of play for the franchise. Embrace it for what it is, rather than dismiss it for what it isn't. Really hope they have nunchuk and classic controller support. Don't want to be going through this multiplayer NES style. Metroid Other M officially proved you need analog for intense 3d games. before yesterday, if you were to say mario learned the shadow clone jutsu, i would have could you crazy. who new this game was packing heat? Is this the same game they showed us before? I actually want it now. This is the moment where I turn around in the hater's faces and say, "HA!" But in all honesty, I was not expecting that. After the E3 trailer, I envisioned something completely different...not anymore. GOOD JOB, Nintendo, this looks absolutely fantastic! Can't wait for November 22! Don't understand why people thought they would go with a Sunshine sequel. It was the lowest selling 3D Mario game (thought great) on they're least successful console...that's not a legacy they want to continue. Anyways was sold with the E3 demo, but this trailer just blew it out of the water. Don't normally do it, but definitely day one purchase. I was not excited for this game. Thought it will be fun but not much different than the usual. Then they release this trailer. I am stoked and wished they had shown more at E3. This definitely shows that the Wii U has more potential than before and has me excited that there is more to this game than "it's just another Mario". So when the next 3D Mario game is released on the next console are we gonna just learn that Nintendo don't make mistakes when it comes to this series. No matter how boring the trailer, you should never judge things. What I will say though is they need to update there 2D series after rayman legends literally blows new super Mario bros u out of the water. @JaxonH Agreed as usual, Jax! I'm hoping for the Koopalings return in this game. I didn't feel the same way everyone else felt when they announced this game at E3. I was pretty stoked for it. Now I'm even more hyped for the game. I'm glad that DKC:TF was pushed back. You don't want 2 blockbuster games coming out literally within weeks of each other. It takes away from either game. This game looks great and it's my most anticipated game of the year, on any platform, but it's a pity this is basically the only game I'm excited about on Wii U this coming holiday season. Wind Waker HD looks good too but that's just an HD update to a ten year old GC game so I can't really get too excited about that and I guess Wii Party looks fun but it's not really mind blowingly exciting. Losing Donkey Kong Country Returns: Tropical Freeze this year was not good and especially with the situation the Wii U is in right now. The Wii U REALLY needs all the big AAA titles it can get. Still, at least there's on game to be excited about on the system this holiday. They Nintendo Life staff, by checking my previous comments, can confirm that all the times this game got a bad article i was saying that i was too early to judge and that if it expanded the 3D Land concept i would be great, well there you go. It makes sense now delaying DKCTF to early 2014, this Mario would be too much competition while DK deserves it's own spot. It's SOOOO funny to see all you people who claimed this game wasn't the next true Mario "Galaxy" game eat your words; even though it was clear even when it was first shown then that is was the next true 3D Mario game and that you'd only seen a tiny snippet of what the game had to offer but still enough to know better. This IS the next proper 3D Mario platform game and it always was. "Today's Nintendo Direct broadcast... may help to win over some of those with doubts about this one's appeal." You got that right! Mario in the cat suit still creeps me the hell out, but yeah, this game is looking like it'll be a lot better than I'd initially thought from the reveal trailer. One detail that I particularly like is the old-school art used for the lives counter. Nice little touch, that. @DestinyMan Exactly what I was thinking. I'd much like to see more of that car. This looks alright but still not astonishing for me to buy. It's also nice that the transparent pipes are explaned: They are from a different kingdom! Also: Yeah for Bowsers car! And I love the cannon! I also like that you can carry piranha-plant pipes! Oh, and Peach with a ponytail! And many new enemies! There's already lots of win in it! This will be sweet! @Kirk You can hardly blame us for being disappointed at E3 when they showed us that lackluster trailer. and tell me those don't look more visually exciting than what they showed us at E3. This one looks like it has some awesome gameplay, but some people like myself just prefer the more open Mario games.